Superbly located just feet above the base of Peak 9, and only a couple of blocks from Main Street, the Cedars at Breckenridge Townhomes for sale are surrounded by a peaceful common green space in summer, and a hassle-free, lift-serviced snowscape in winter. Ski-in and ski-out on the gentle runs near the base of the Quicksilver Lift. The Cedars have the clean feel of a modernist split-level ranch house, and underwent a complete exterior remodel in 2005. They are still cedar sided, but now have stone accents common in new mountain construction. These townhomes were built on the principles of New Urbanism before those were buzzwords. The garages are underneath on the outside, or driveway side, and the front doors face onto a common landscaped yard. 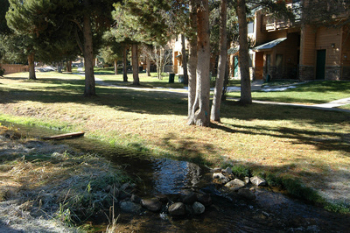 A small stream flows alongside the south side of the complex and across its footbridge is the Quicksilver. Ready to find the perfect townhome in Breckenridge? If so, then browse Cedars at Breckenridge Townhouse listings below! Otherwise, find out more about living in this spotless community. In addition to quick access to Alpine skiing, the Burro Trailhead is 100 yards away and is great for hiking, biking and cross-country skiing. The Cedars Townhomes are part of the Upper Village Homeowners Association, which maintains the nearby Upper Village Pool, which was completely remodeled and put back into service in December of 2009. This swim center includes three hot tubs, one interior and two exterior. Located on Village Road, it’s less than a block from the townhomes. Another block, past the pool, is the beginning of downtown Breckenridge with shops, restaurants and clubs. Shuttles also run up and down Village Road to the outlaying supermarket and the other ski base stations. A Cedars at Breckenridge Townhome for sale will appeal to anyone who values its park-like setting and easy ski access. Size: from 1276 sq. ft. to 2972 sq. ft. Amenities: landscaped common area, on ski run just above Quicksilver Lift, Peak 9, common pool and hot tubs. True ski-in and ski-out. Cedars at Breckenridge are located directly on the ski run just a few feet above the base of the Quicksilver Chair. Glide down to the maze and this Super6-style will give take you to a great vantage point on Peak 9. Drive south on Park Avenue and turn onto Village Road. The Cedars are located on the left about ¼ mile up. Two entrances are marked with a sign for the Cedars and form a U around the units. An expert from Breckenridge Associates would be happy to discuss Cedars at Breckenridge homes for sale. Call (970) 453-2200 or message us online to get started.